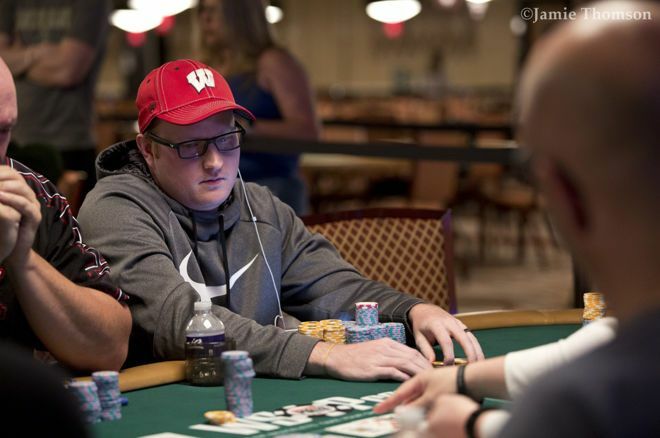 11-time WSOP Circuit ring winner Josh Reichard shares tips to those seeking to up their games. Having a group with whom to discuss strategy can be a big help to your game, says Josh Reichard. Last month, Josh Reichard captured his 11th World Series of Poker Circuit ring at his home state casino, the Potawatomi Hotel & Casino in Milwaukee, Wisconsin. His victory in the $400 Pot Limit Omaha event tied him for second on the all-time WSOP-C rings list, putting him just one behind leader Valentin Vornicu. Reichard's win was made even more memorable since few days earlier his father, Brett Reichard, captured his second WSOP-C ring in the one-day $400 no-limit hold'em event. Since August 2016, the father-son duo has taken home a combined nine WSOP-C rings. Reichard's recent success has extended beyond the WSOP-C, as he also won the Heartland Championship Event last November at Ameristar Casino East Chicago. That win earned him his largest career cash of $221,293, helping boost his overall total to more than $1.2 million. I caught up with Reichard recently to discuss his recent success and ask him for some tips to help fellow players improve their games. PokerNews: Congratulations on all of your success over the past couple of years. Josh Reichard: Thanks. I definitely have been on a heater. What a week in Potawatomi for the Reichard boys! How great was it to win your latest WSOP Circuit ring within days of your father winning his second ring? That was fantastic, especially because my Dad got me started in poker and taught me the game. When I was young, he played poker and we used to have small family tournaments just for fun. Early on in my career, my Dad and I used to travel together all the time. Today, we still travel together, but about half the time. He had been kind of unlucky over the years, but finally won his first [ring] in Cherokee [in August 2016]. I was so happy to see him win. Nobody deserves it more than he did. Now, for us to win together during the same series and also in Wisconsin, our home state, it doesn't get better than that. I think we were both very proud of each other. What did your father teach you early on that you have incorporated in your current game? He has always played aggressively. Of course, the game has changed a lot since then, but he really taught me the ropes. Overall though, we both have learned a lot over the years, playing on the big stage and going through it together. Do you think that you need to play aggressively to be successful on tour? Aggression is important, but I don't think that is the only style of play that is successful. One of my good friends is Aaron Johnson, who just captured both the HPT and Mid-States Poker Tour Player of the Year for 2018. His playing style and mine are completely opposite. He plays a real solid game with low variance, but I play a higher variance, more aggressive style. I typically have my stack on a yo-yo. But we are both successful on tour and have done well in our own right, playing two completely different styles of poker. What do you attribute your accelerated improvement and current success in poker? First, I truly love the game. I'm always thinking about it and want to talk about it all the time. Sometimes to a fault. But I just love poker. Also, I truly attribute my improvement in my poker game to having a good group of poker minds to bounce hands and strategy off of. How important is it to have a diverse group of players with whom to discuss strategy? Yeah, many of my friends all have had success, winning WSOP Circuit rings including Chris Conrad, Mark Fink and Mo Nuwwarah, and many have different styles. So if you can hear hands from a different perspective and thought process, this really gives you a different way to think about the hand that you may not have initially thought of. Another reason why this is helpful is you may be able to relate to other opponents' styles better since their style may be similar to your friend's style. Now after understanding the different style, it may be easier for you to adjust to your opponent and possibly relate to their thought process. This probably wouldn't have been possible if you didn't hear one of your friend's different perspective. Poker has a lot of variance and can be tough when don't cash tournament after tournament. How do you stay focused through the ups and downs in poker? I think that staying level-headed is my best attribute in poker. I'm just a laid-back person and I'm not going to get upset very easily. I think it has really helped my poker career. I have a lot of friends who are extremely good players, but they just can't mentally handle the swings of poker. Overall, players have to accept that bad beats are part of the game. Players just really have to let go of the bad beats or else it will affect your game. Ultimately, you will not be able to play your best moving forward. Now that you are so close to becoming the all-time leader in WSOP Circuit rings, is that your ultimate goal? I think goals are very important and it's good to have them. But it's not one of my biggest goals. I not going to travel to WSOP Circuit stops more often just because I'm close to taking over the all-time lead. I'm just going to play my same schedule, and if it happens, it happens. But, it would be nice obviously. In your mind, how important would it be for you to win a WSOP bracelet? Ranking my goals in poker, winning a bracelet is pretty high up there. It's far above taking the overall ring lead.